There is a reason the captain of a Stanley Cup Champion is the first the hoist the best trophy in all professional sports. The captain symbolizes all that is right in hockey. The captain is not only the best player; he is also the inspirational leader. Having said that, what happened to Jonathan Toews this postseason? No goals, no points, very uncharacteristic. Taking penalties, yapping at referees and opponents. Definitely not the Toews Blackhawks fans know and love. Toews is nicknamed “Captain Serious” because he doesn’t joke around. He’s straight-shooter as they say. 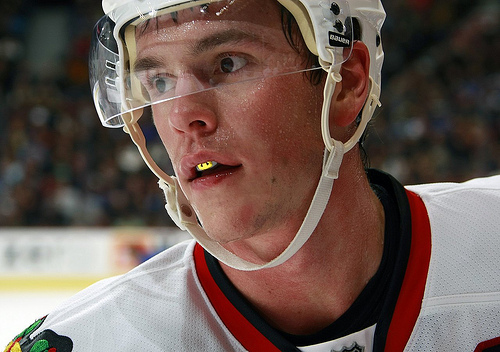 Chicago Blackhawks Captain Jonathan Toews is widely known for being an even keel player. Never getting too high, getting too low and most importantly, he never shows up opponents. Just like his idol former Colorado Avalanche legend Joe Sakic. That is the reason Toews wears the number 19. Like the rest the Blackhawks, Toews has been taken out of their game by a veteran team in the Detroit Red Wings. The physical play and yapping at the opponent is not what they do. It seems like the Blackhawks picked an inopportune time to play like a roller derby team. Dominating the puck is what they do. Maybe they will wake up and find the team that breezed through the lockout-shortened season. Like the fans, I expected more from a Triple Gold Club winner. We all know how elusive membership to such a club can be. He was also a standout member of Team Canada’s gold medal winning performance in Vancouver. He was one of the best forward on the team. Earlier this year, I covered the opening ceremonies for the Hockey City Classic at Chicago’s Soldier Field. Former Blackhawks legends Bobby Hull and Tony Esposito were also in attendance. After the press conference Hull was on the phone with someone talking about how much of a leader Toews is. He also mentioned how Toews was the best choice to captain such a storied franchise. That’s an endorsement if I ever did hear one. Toews and the Blackhawks need to get back to the basics. Whatever worked when the Red Wings couldn’t hang with them, go and do that. Somewhere along the way, things became complicated. Toews along with Coach Joel Quenneville, will simplify things for the team. If some line changes need to be made, so be it. The team has entered desperation mode. All hands on deck. Seeing Jonathan Toews become unraveled in game four had to be unnerving for Blackhawks fans. Don’t expect for the team to lie down for the Red Wings even though the immediate future looks bleak. The Blackhawks will come out tonight with a spirited effort. The do not want to end such as record-breaking season on such a disappointing not. After all, he is the captain for a reason.